Counseling is almost a day to day requirement in the Army. Whether it’s about documenting career milestone, guide soldier growth or recording proper or improper behaviors of the soldier, counseling includes all such activities. It is crucial to possess adequate words to describe any soldier’s potential and performance. Army counseling forms give you the right way to perform counseling in an accurate manner. So check out below listed performance or training evaluation forms and download the required one. You may also see Employee Statement Forms. 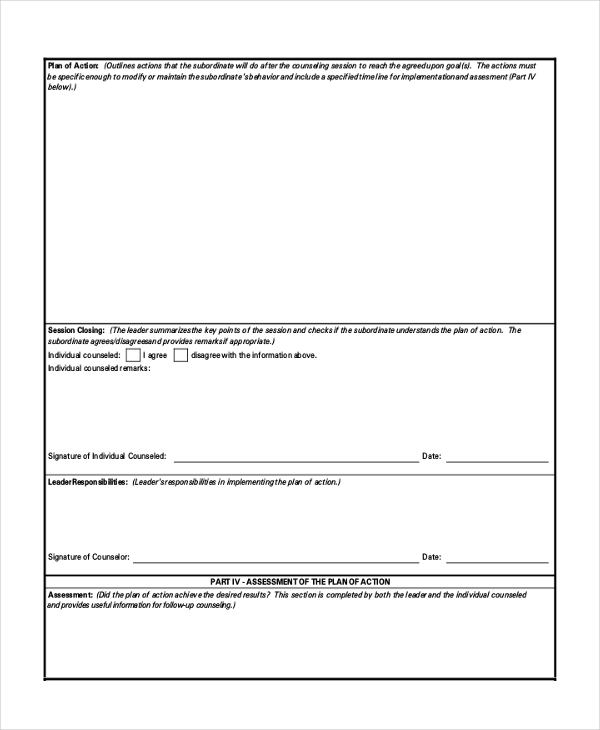 Check out this Army initial counseling form and evaluate the soldiers on a wide variety of standards. 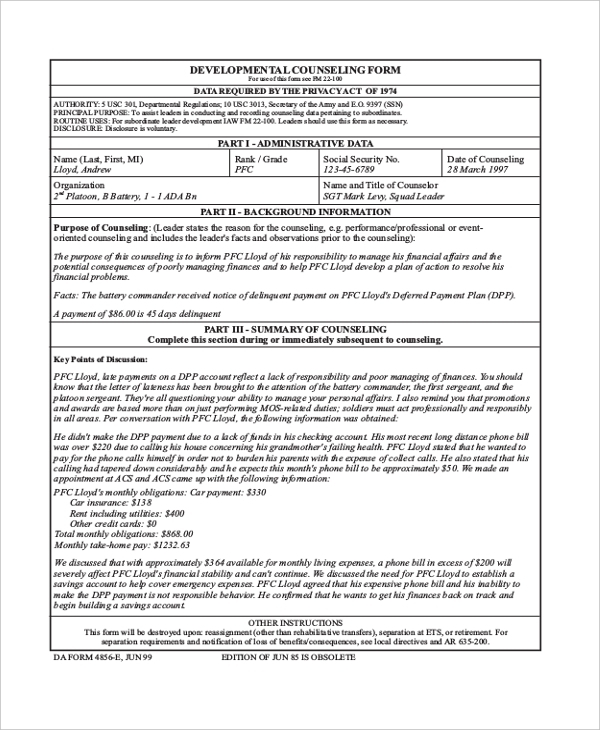 This form is available in PDF format that you can customize easily. Download now. Here is another army counseling form available for instant download that lets you analyze the performance, behavior, mindset and potential of army personnel in the easiest manner. This PDF format is customizable. Explore the potential of your army team while also finding the areas where appropriate development measures need to be taken to build the potential and caliber of the soldiers with this army development counseling form available online. Thus army negative counseling form has been designed to help you complain or list the negative things that happened to you in the department. You can get this form downloaded instantly and customize as per your needs. 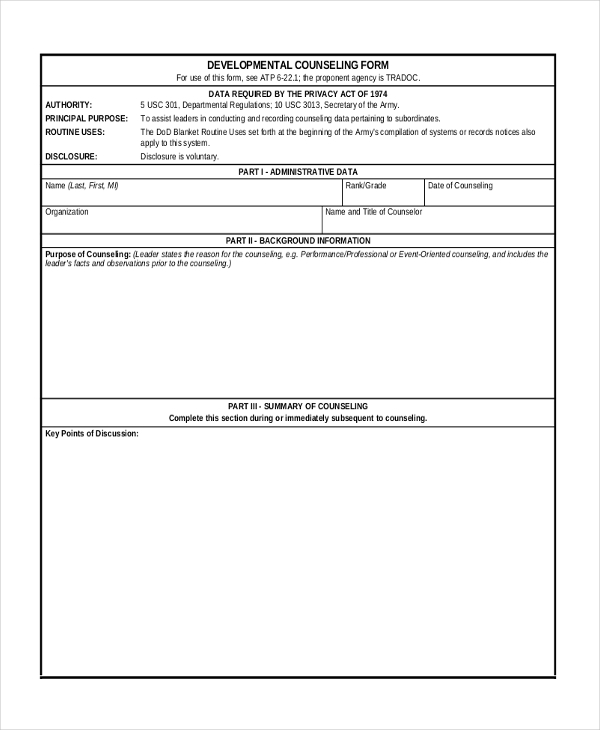 This blank army counseling form is quite simple and easy to use. It is meant to be utilized for different kinds of army counseling needs. Just get this downloaded online for free and start filling with your personalized data. This army counseling statement form has been meant for a wide variety of purposes ranging from recording evidence for the investigation to informal counseling. Can be edited easily with personalized data. This pre-separation counseling checklist sample comes with a set of five different sections with each section meant for providing a set of different information. Available in PDF format and can be customized easily. How to Use Army Counseling Forms? 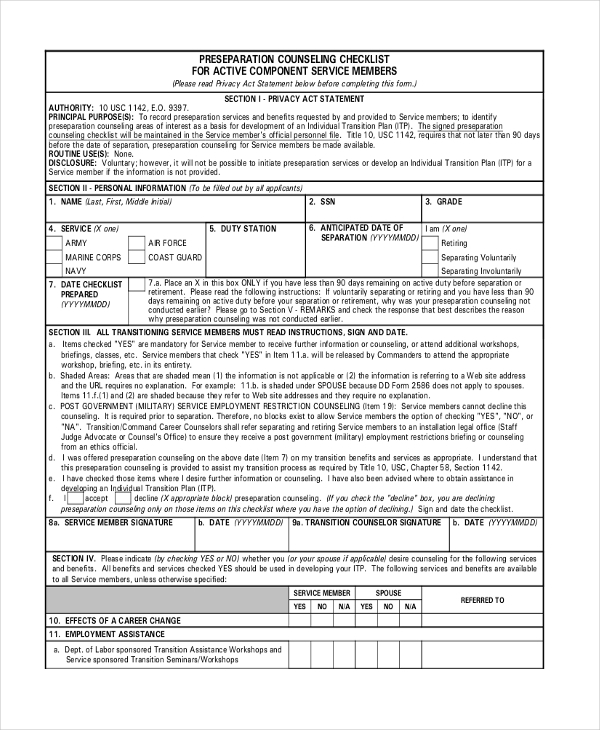 Army counseling forms come with enough space to fill the asked information in. These forms are meant to help army personnel pass their messages to concerned authorities. You need to send these forms after filling to the assigned authorities in the chain of departmental or official communication. These can be picked from the relevant departments. You can also see Interview Evaluation Forms. All the necessary information need to be filled thoroughly so that the core purpose of form can be fulfilled effectively. In case you have any queries regarding form format, spacing, submission terms and all it is recommended to discuss the doubts with concerned officials to get the effective solution. you may also see Sample Consent Forms. What are the Benefits of Army Counseling Forms? There are a large number of benefits of Army counseling forms a few of which are mentioned below. These forms can offer a wide range of information to the department ranging from the potential of a soldier, correct/incorrect behavior, developments required and more. 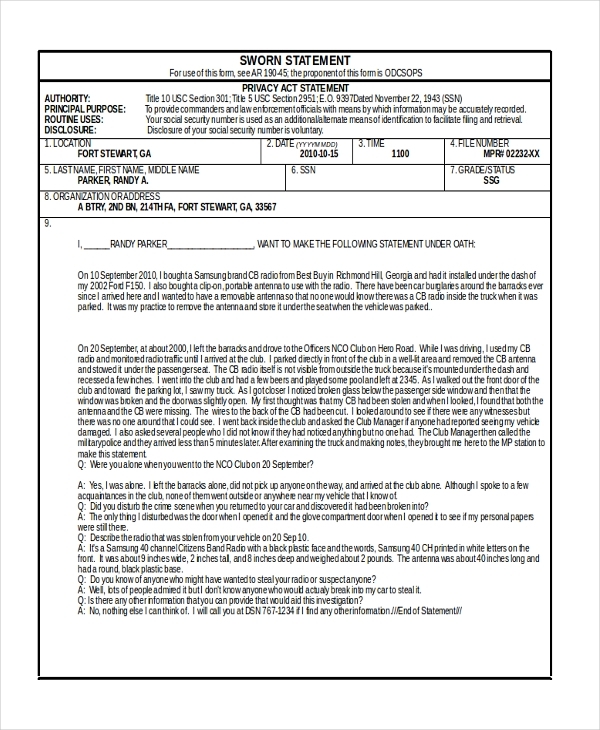 Some of these army counseling forms come in word format and other come in PDF format and both may it easier for anyone to fill specific information thus making the communication easier. 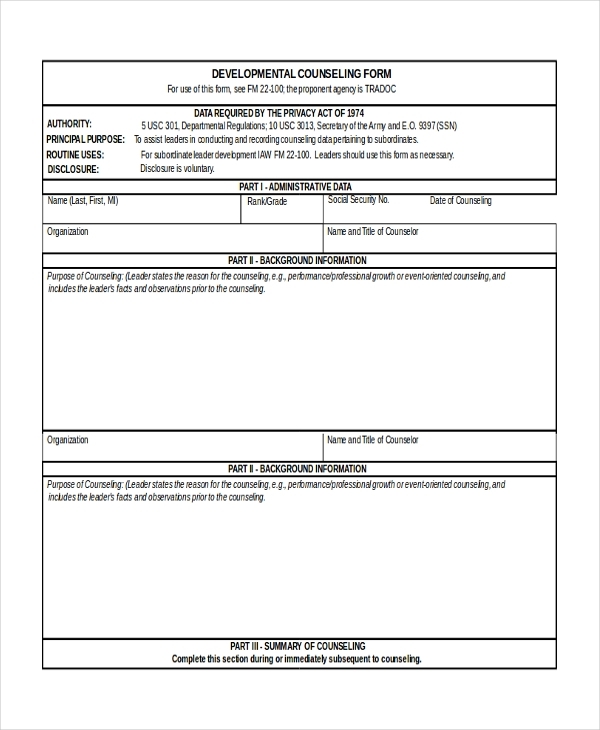 An army counseling form helps to thoroughly provide the counseling summary with details of the plan of action required to be performed as a response to the counseling information. If you need an army counseling form for any kind of your counseling needs particularly in the army then all the above-listed forms are one of the best options that you can utilize for collecting convenient, quick and detailed counseling information. These forms are highly easy to customize and also offer organized information.